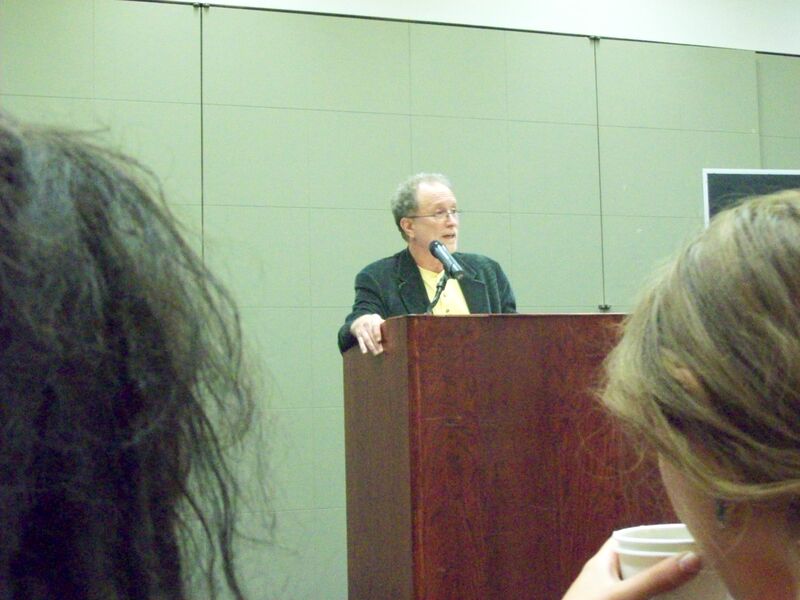 Monday, April 6, 2009 CLAREMONT, California - Bill Ayers, professor of education and co-founder of the radical antiwar organization the Weather Underground--labeled "domestic terrorists" by the FBI--spoke to a crowd of about 300 this evening about activism, Obama, and education. A recurring theme of his talk was the importance of movements (in contrast with the common emphasis on leadership) in bringing about social change, and his exhortation was that we in the audience participate in those movements. There were probably about three hundred people, mostly college students but with the notable presence of older members of the community, seated in the Gold Student Center at Pitzer College, a prestigious private university about an hour east of Los Angeles with a reputation for a faculty and student body that leans strongly to the left. Outside, a woman wandered the service roads with a large anti-Ayers sign and a t-shirt demanding justice for a slain police officer, and Claremont Republicans distributed anti-Ayers propaganda. But inside, the crowd was mostly sympathetic. "I've urged people for months now, that any time you have the impulse to put the press on the Obama administration, which I'm not against, but when you have that impulse, you have to start by asking yourself, 'What press have I put on myself? What am I demanding of myself?'" "We ought to be thinking hard about how we to build a movement within that gap--within the gap of rising expectations for a better world but serious limitations about whether the world as we know it can possibly go on indefinitely into the future, and I would argue that no, it can't." He elaborated on some of those limitations, most of them environmental, and then continued. "First thing is [...] you have to open your eyes to the world around you as it is. "Step two is doing something about it. "Step three is rethinking. Criticizing yourself. Rethinking whether everything you did made all that much sense." Good advice all three, but it is difficult not to read into step three undertones of regret and the shadow of the Weather Underground's excesses. By way of illustration of the primary call to awareness, Ayers prefaced with the historical example of the abolitionist movement. "If we were hard-core abolitionists [in 1840], let's just remember this: we would've been against the law, we'd have been against our parents, we would've been against tradition, common sense, the Bible, our preacher, our brothers and sisters, and almost everybody we knew." He continued with the example of women's suffrage movement. "If you were for a woman's right to vote, you'd be against the law, against tradition, against the Bible, and on and on." There may be many things we are not aware of because we accept them uncritically, but Ayers provided two examples: the overwhelming influence of money in the US political process, and the prison-industrial complex. He joked, "Thirty years from now, when your grandaughter says to you, 'Were you around when the first African-American president was elected?' and if things work out well, you can say 'Yes I was' with a certain amount of pride. 'And I even knocked on doors, and I did this and did that.' And then she might say, 'Is it true that it cost him three-quarters of a billion dollars to be elected? And you call that democracy??'" And continuing the metaphor of the hypothetical granddaughter in a much more serious tone, "Your granddaughter will say, 'So you went to the Claremont Colleges and when you went to college there were 2.3 or 4 million of your fellow citizens in prison? And there was one just miles from your campus?' With my students, I often tell them, 'One mile from our campus in Chicago, there are 18,000 black men caged. And it's a gulag and nobody sees it and it's invisible. It's just what what we get acclimated to, we assume, what we take for granted.'" Ayers went on to discuss the anti-death penalty movement and its role in the 2003 implementation of a moratorium against the practice in Illinois by the "right-wing, mildly corrupt, now imprisoned Governor George Ryan." He continued, "It gave me a lot of hope that not only good people like you do things, but people you wouldn't even expect. If you organize properly, build a movement, even George Ryan can do the right thing." This was despite the popular fervor, promoted on AM radio, surrounding the execution of serial killer John Wayne Gacy only nine years prior. He explained the process: "The people of Illinois might be perfectly happy to execute people, but not arbitrarily! And so we saw in Illinois, in six years, in four years, a movement built that changed the state of justice in Illinois. What an amazing thing! What an exciting victory!" The movement was a result of peoples' action. "You have to act. How you act, I don't know. You have to stand up and be heard in the public square. It's not good enough to think 'I'm a good person' and sit happily ever after on my couch in my dorm room. You have to be good in the world. You have to say where you stand in the world. And once you say where you stand on questions of justice and peace in the world, you have the world pushing back against you. And then you begin to learn, and you push back, and you get pushed back. And that's how we learn." Also important in terms of dealing with reality as it is is the act and art of persuasion. "If you convinced somebody and you learned something, then it was probably a good action. But you have to persuade somebody. And that means, among other things, learning how to talk and how to change the frame." Elaborating on the third course of necessary action, Ayers warned, "You have to doubt. If all you do is act and you become an adventurist, you become narcissistic. You become certain of yourself. You become dogmatic. You become trapped in a prison of one bright idea. But that problem of dogma, the problem of certainty, the problem of a single idea, this was really the problem of the Weather Underground. It was too sure of itself. It was too sure it had figured it out. And that's wrong. It's always wrong. There's always something more to know, so that third step is critical." During the presidential campaign, the McCain campaign and other sinister forces tried to paint Obama as an extremist by tying the Democrat to Ayers, who was pursued by federal authorities for his role in a series of bombings of "monuments to war and racism" in the late 60s and early 70s. Following the talk, a member of the audience brought up the acts, challenging Ayers to apologize: "I'm certain that I ask this question on behalf of tens of millions of my fellow Americans across this country, perhaps even a few in this auditorium. Mr. Ayers, since you willfilly exploded bombs in acts of violent domestic terrorism, against your own country, the United States of America, do you not feel sir, profound guilt for these evil acts and do you not feel morally compelled to express extreme remorse and to apologize to the citizens of this great nation, and especially to the brave veterans of this country who fought and died to preserve the very precious freedom which you so shamefully and disgracefully abused by perpetrating your vile acts of traitorous terrorism?" and [...] break the law." Finally, he higlighted the intensity of the war and the movement against it. "When 6,000 people are being murdered are being murdered by your government, you have a responsibility to do something. And my four siblings and myself each did something. He contextualized his role in the struggle by discussing it in terms of the roles his siblings played therein. "I have never defended what we did or said it was a bright or brilliant thing to do. No. But I will say, that in my own family (I have four siblings), and among the five of us, we made five choices. One of us joined the Deomcratic Party and tried to build a peace wing within it. One of us ran away to Europe. One of us went to a commune and built free land and free love (my favorite). One of us went into the industrial corridor of the Northeast and tried to organize workers to oppose the war. And one of us founded the Weather Underground. Now tell me which one of those five had the right strategy?" Ayers entertained other questions about Obama's approach to change, ("Theories of change are badly flawed. The unintended consequences overwhelm what you intended to do.") the role of education in social change, (we should shift the debate away from the idea that education is a product) different models for organizing (the Alinsky model ACORN uses is just one, we should look into the Highlander school) the role of the internet in organizing, (transcend the generational/decade paradigm; use humor and art to transmit information), the Democratic Party, (it's not actually a party but a "collection of blocs"; if you go into a party keep an independent mind) how he related with his father (they were always close, except for the years he was underground), and rights (the Universal Declaration is a good place to start). by building a movement for justice and peace, and get busy tonight." After the question-and-answer session he hung around to chat, answer more questions, and take photos. One man I talked to, a Pitzer student, said that he enjoyed the talk, especially Ayers' emphasis on introspection and self-criticism. So I listened to the audio...not many new or original insights whatsoever. King was a radical, a revolutionary. The 60s are mythologized. A lot of politics is framing. Anti-racism, anti-sexism, anti-homophobia, environmentalism, de-militarization. Community organizing. Brazil is cool. Buzzwords like "Drink the kool-aid," and "Digital immigrant." ...Rockero you're reporting is newsworthy! 1) The US is an oligarchy--I'm sorry, but that's the truth. To claim that it is a democracy (as Ayers here does) is obfuscatory at best. 2) To claim that a non-white person has now taken control of one of the most offensive and destructive institutions of the world represents historical progress seems a bit presumptuous. 3) Anyone who holds to the views criticized in points 1 and 2 above cannot justifiably be called a radical, in my view. Such claims are typical liberal fare, and in no way radical. I was at the talk and I heard Prof. Ayers speaking with Pitzer students afterwards. I overheard him say, "I'm not a capitalist." I don't know whether he meant that he does not practice capitalism or that he doesn't believe in capitalism, but any step away from capitalism is an important step to be taking.